Home > Unusual Watersports > What is Underwater Hockey? For those looking for a new and exciting sport to try then there are few in the watersport world offering as many strange delights as underwater hockey. Underwater hockey - or ‘octopush’ to give it its more suitably bizarre name – is a non-contact water sport that takes place beneath the surface of a swimming pool and involves two teams of six competing to manoeuvre a puck into the opposition’s goals. The actual puck play takes place on the bottom of the pool and so a player’s effectiveness is governed by how much time they can spend under the water before climbing up to the surface for air. During the game exertion typically limits bottom time to less than 30 seconds. The sport was devised in England in the 1950s as a way of keeping members of a Southsea sub-aqua club entertained during the winter months when it was too cold to dive in the sea. Its popularity today can be judged by the latest world championship contest in Sheffield where 44 different teams from 17 countries competed. Needless to say underwater hockey has never caught on as a spectator sport. 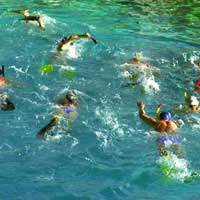 Underwater hockey can be described as an odd fusion of swimming, snorkelling, hockey and water polo but really that’s no help in grasping the concept of the sport, the best way is to try it out. Despite being a ‘non-contact sport’, underwater hockey does have its fair share of injury risks. Many of these are largely dependent on how competitive the sport is played. For example competition matches involving experienced and athletic octopushers can get as heated as their ice and grass-bound cousins, and result in a variety of minor cuts and breakages. However standard matches are usually good humoured affairs and not provoke much cause for alarm. Unlike those ice and grass-bound cousins however, the potential for injury is reduced by the cushioning effect of the water. The best way to get involved in underwater hockey is to try it out at a local club. There are a surprising number of underwater hockey clubs around the UK offering taster sessions where all the snorkelling equipment is provided. Usually all one needs to take along is a swimming costume. Those that decide underwater hockey is for them would then be advised to take a basic introductory course, which will be available either at the club or through the club. The sport requires a variety of different equipment to be played effectively and safely. All players wear a mask and snorkel so they can not only see underwater and breathe at its surface, but as face protection and an effective nose plug. The mask should be made of tempered glass to avoid injury. Many also wear ear protectors to protect their ears from any stray fins, although a water polo cap would suffice. The fins themselves are soft free diving fins that allow the user to manoeuvre quickly and speedily. Gloves are also standard, in particular heavyweight gardening-style gloves covered with hard glue, to protect players’ hands from stray sticks and fins. The sticks themselves are about 12 inches long, made of wood and either painted black or white, depending on which team the player is on. As a fast moving water-based sport, underwater hockey is not only a great way to keep fit but a relatively safe one too. Also the techniques the activity promotes, such as lung capacity, are superb training for other watersports such as swimming and free diving.